set of Kip Thorne lectures, freely available on the internet, from a class he taught at Caltech on gravity waves. The lectures are pretty tough going and you better be pretty good at tensor calculus to keep up. I have to listen to them a couple of times and I can understand the homework, but can't often work out the problems on my own without looking at the solutions. Oh well, I'm making some progress on the physicist wannabe front. One of our little group, Science Squad Gravity Guy, Ken, found an interesting paper that proposes an alternative explanation for what dark matter is. The authors say that dark matter might be made of, not massless spin 2 gravitons, but heavy spin 2 gravitons, which are not connected to ordinary baryonic matter and do not interact with ordinary matter and this is why it hasn't been detected in ongoing experiments and won't be produced in colliders like the LHC. It sounds far out but it could very well explain why 30 years of searching for dark matter has not turned up any evidence. Who knows? Thanks Ken. Another paper just out by Sean Carroll proposes an idea for consideration that tries to establish a connection between quantum entanglement and gravity. It seems that the mathematics used to understand entanglement can be extended so that what we think of as gravity just follows automatically from entanglement considerations. Could this be the starting point of integrating gravity with quantum mechanics? I don't know, I can't really follow the paper. Its too hard. We have to wait and see. So, after wearing my self out on these papers, I met up with Trying to Build a Cubesat, Dr Don, for a four hour, and similar number of margaritas, lunch study session trying to understand quantum mechanical spin. How is spin of spin 0, spin 1/2, spin 1, or spin 2 particles tied together with the properties of the particles and the number of degrees of rotation needed to return a particle to the same state and symmetry condition? Anyway, my head was spinning for at least a couple of reasons. Thanks Don. Ok, ok, back to some astro photos. I set up the little auto aligning mount with the 600 mm telephoto and started to get better prepared to begin gathering light curve data for the eclipsing binary star, Sheliak. Remember, Sheliak has a 12.9 day period and its brightness varies from about magnitude 3.3 to 4.3. I took a couple of images last week, with exposures from 5 seconds down to 2.5 seconds, but when I analyzed the photos, the star image was severely overexposed. This time I tried exposures from 1 second down to 1/8 second. They were all overexposed except the 1/8 second exposure. 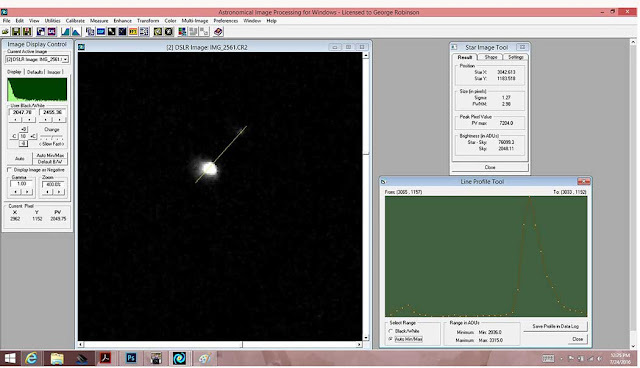 See the attached photo for the pixel count total and line profile through the star. 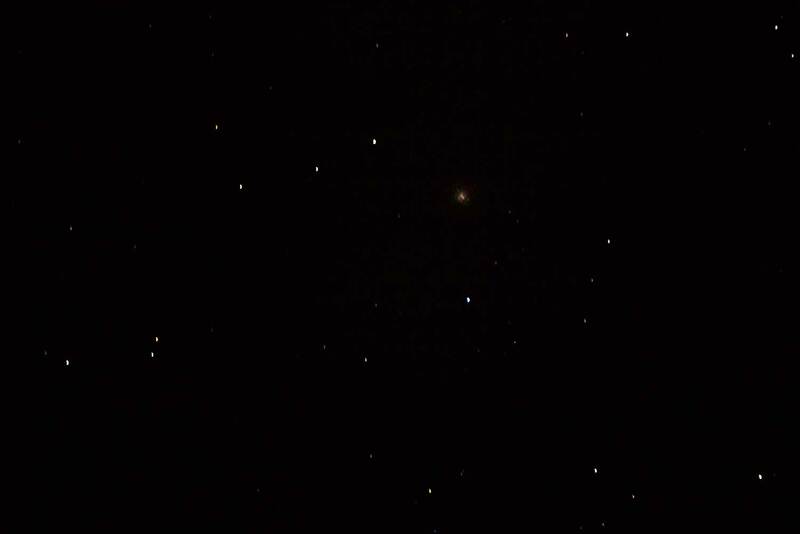 Now if Sheliak just happened to be at its maximum brightness, I can continue to use this 1/8 second exposure setting. 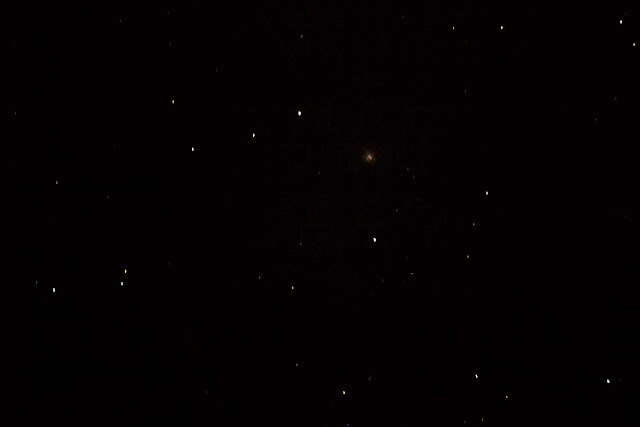 But if the star just happened to be at its dimmest value, then sine a magnitude change of 1 corresponds to 2.5 times more light, the next round of images will be overexposed. So, what to do next time? I think for now I'll just take at least two images per observation, one set at 1/8 second and another set at about 1/15 second or thereabouts. Hopefully that will take care of the problem. I can't set the exposure much lower than that because the signal to noise ratio will be a bit low for good accuracy. Anyway, I'll let you know what I start to find out. While, I was collecting this data, and after Resident Astronomer, Peggy, had returned home, I was surprised by some visitors walking around the observatory grounds. Grandma Pam and Just about a Teenager, Natalie, showed up and expressed some interest and curiosity, which was welcome. So I showed them some images of double stars like Mizar and the blue/gold double star, Albireo, and of course Saturn's rings. Natalie was quite excited and interested. I had forgotten some of the excitement that folks not used to looking at the sky with telescopes can experience and I was glad to be there to experience and share it. Thank you Pam and Natalie! Later, I reviewed an image of M13, which didn't show up too well in the camera, but after some slight processing, turned out ok, at least for a 600 mm lens. See the attached photo. Finally, it was Saturday, and our big day, after waiting almost a year, of going to Mt. Wilson for a night of observing on the 60-inch telescope had arrived. This was our 3rd attempt, previous attempts cancelled due to clouds. The weather forecast was perfect for good viewing. 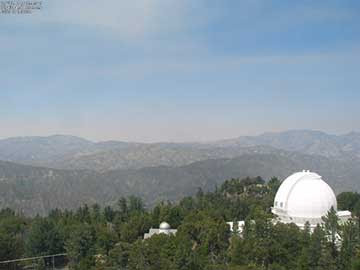 The only problem was a large brush fire, the Sand fire, in nearby Santa Clarita, was kicking up a lot of ash and travelling 10-15 miles towards Mt. Wilson. The forecast in the morning seemed doable (See the attached photo from the Mt. Wilson Tower Cam) seemed quite clear. Later in the day, the forecast for ash at the telescope turned decidedly bad (See the afternoon tower cam photo) and the observatory staff cancelled our night of observing. 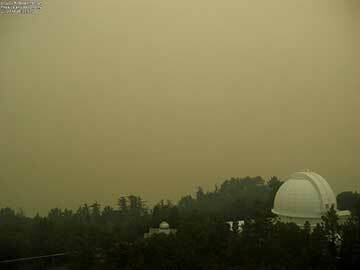 It seems they were not going to open the dome and were not going to expose the telescope to any falling ash. Darn, so just at 2:00 PM as we were getting ready to pack up and go, we got the email message saying the session was cancelled. 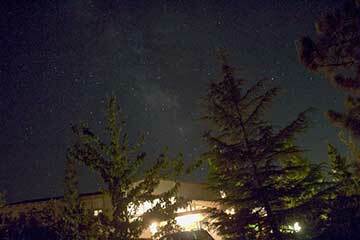 This was our third cancellation and Resident Astronomer Peggy and I were quite disappointed. Now what to do? Even Astronomer Assistants Ruby and Danny were disappointed because they didn't get to spend the night with Our House is Full of Dogs, Bob. Sorry guys. Well, my copy of Sky and Telescope had just arrived in the mail so that helped, but what really helped was a late lunch with a few consoling martinis at BJ'. Now that really helped assuage the disappointment. Now we have to wait again for the next available viewing date, sometime in November or December, or later, and we know that those months often get pretty cloudy. Well, that is about all I can take for this week. On balance we had a pretty good week with some success and some disappointment. I hope you all had a good week. Anyway, just for fun, I wanted to share a cartoon from a very good book, which I've been really enjoying, on gravity and cosmology, "Gravity -- From the Ground Up", by Schutz. I think sometimes I'm in this field not to make money for me, but to deliver money to other folks. How about you?